So the first thing I did was to look at the gender ratio of speakers. I dug into each person listed here as much as a I could and attempted to infer what their gender is. I realize this is fraught with problems and have written about this previously. So as much as possible I looked for what pronouns were used to describe these people before infer their possible gender. I was unable to get any clear gendered pronouns for one person but the others I think I got enough evidence to make a hypothesis. I colored those I inferred to be male in yellow and those I inferred to be female in green. Thus of the speakers (keynotes and invited) I infer a ratio of 18 men to 2 women (and one unknown). So that is 10% women. Not remotely representative of the gender in the general area of microbial communities. 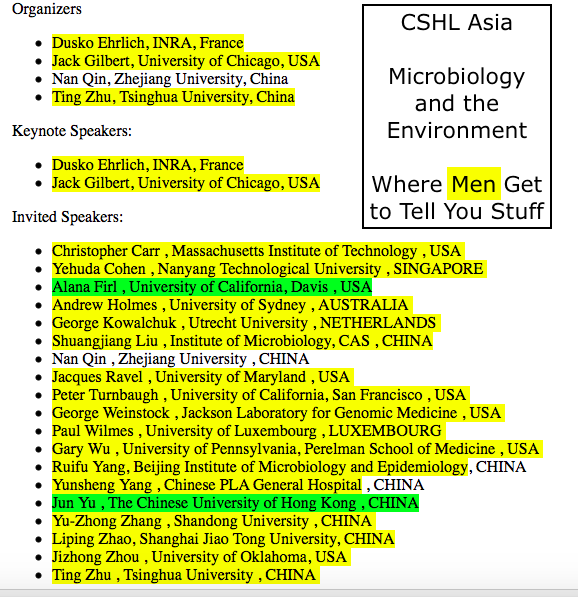 I note – this whole thing saddens me even more because one of the invited female speakers is Alana Firl, who is a post doc at UC Davis jointly working in my lab and Sundar’s lab. She is completely awesome and brilliant. But this meeting? Well, it is a manel (a panel of mostly men). A YAMMM (yet another mostly male meeting). And a disappointment. So I decided to see if maybe it was just this meeting in the CSHL Asia series and if others were all OK. So I went to their list of past meetings and looked at just the keynote speakers. Precision Cancer Biology and Medicine: 3 keynotes. All male. Membrane Proteins: Structure and Function. 1 keynote. Male. Lipid Metabolism and Human Metabolic Disorders. 3 keynotes. All male. Frontiers of Plant Biology: Epigenetics & Development. 2 keynotes. Both male. Novel Insights into Glia Function & Dysfunction. 3 keynotes. All male. Francis Crick Symposium: Advances in Neuroscience. 2 keynotes. One male. One female. Molecular Basis of Aging and Disease. 4 keynotes. 3 male. Tumor Immunology and Immunotherapy. 2 keynotes. Both male. So in these meetings it is 29:3 male to female for the keynote talks. Less than 10% female. Great. CSH Asia meetings. Where men get to speak about all the stuff they know.